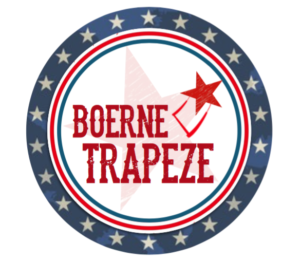 Boerne Trapeze – The Only Flying Trapeze School in San Antonio – The Only Flying Trapeze School in San Antonio – Come fly with us! For Kids and Adults!! Face your fears and try the trapeze! Flying Trapeze Classes for Kids ages 7+ and Adults. Flying Trapeze is an appropriate sport for people of all ages and abilities. It is the perfect thing to help you face your fears and will potentially get you into the best shape of your life. Come learn to swing, fly, hang from you knees and even do a backflip! It is fun share the thrill and exhilaration with others. It's a great way to bond with family and friends, both new and old. Looking for a unique team building activity to do with your employees? Our corporate workshops have been designed to be challenging and fun! Our program highlights the benefits of trust and collective performance by breaking down boundaries and developing individual potential, encouraging communication and promoting group cohesion. Trapeze team building is an exhilarating experience that will make your company outing a memorable and fun event. Flying Trapeze is just as much fun as it looks. It's perfect for the whole family. Come learn to fly through the air. Safety lines, a body harness, and of course a net will allow you to fly through the air with the greatest of ease. Flying Trapeze will, in all likelihood, change your life. It did for us. Yay, take the plunge. Visit our schedule, pick out a class and sign up. If you have any trouble, don't hesitate to call us and we can take care of it for you!